In previous 2 articles, we explored a volatility trading strategy based on the volatility risk premium (VRP). The strategy performed well up until August 2015, and then it suffered a big loss during the August selloff. 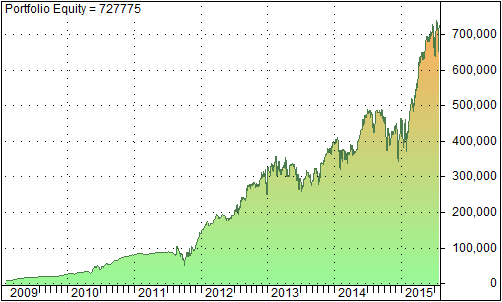 In this article, we explore another volatility trading strategy, also discussed in Ref . This strategy is based on the volatility term structure . It is well known that volatilities exhibit a term structure which is similar to the yield curve in the interest rate market. The picture below depicts the volatility term structure for SP500 as at August 31 2016 . Most of the time the term structure is in contango. 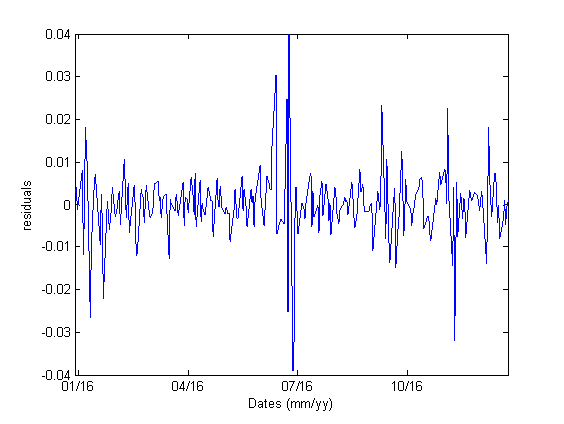 This means that the back months have higher implied volatilities than the front months. However, during a market stress, the volatility term structure curve usually inverts. In this case we say that the volatility term structure curve is in backwardation (a similar phenomenon exists in the interest rate market which is called inversion of the yield curve). The basic idea of the trading strategy is to use the state (contango/backwardation) of the volatility term structure as a timing mechanism. Specifically, we go long if the volatility term structure is in backwardation and go short otherwise. To measure the slope of the term structure, we use the VIX and VXV volatility indices which represent the 1M and 3M implied volatilities of SP500 respectively. The graph below shows the portfolio equity from 2009 up to August 2016. 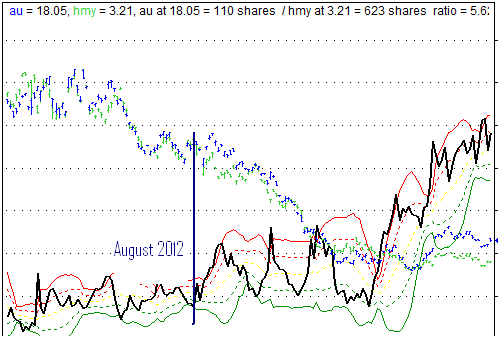 In the next installment we will compare the 2 strategies, volatility risk premium and roll yield, in details. Note that there is a so-called term structure risk premium in the options market that is not often discussed in the literature. The strategy discussed in this post, however, is not meant to exploit the term structure risk premium. It uses the term structure as a timing mechanism. The volatility term structure presented here is calculated based on VIX futures, which are the expectation values of 30-day forward implied volatility. Therefore, it is theoretically different from the term structure of spot volatilities which are calculated from SP500 options. Practically speaking, the 2 volatility term structures are highly correlated, and we use the futures curve in this article for illustration purposes. 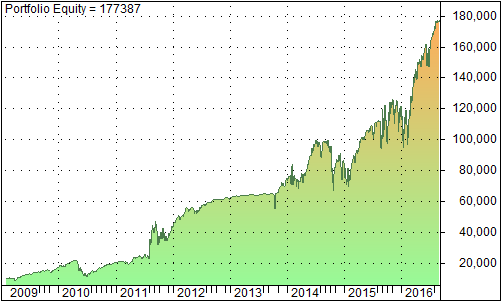 The strategy produced 11 trades with 6 trades (55%) being winners. However, it suffered a big loss during August. The graph below shows the portfolio equity since last August. 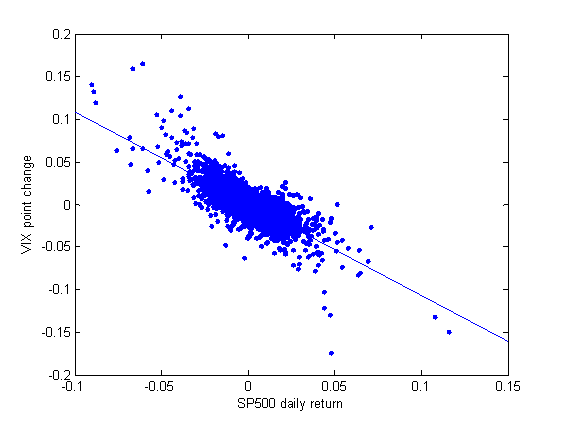 Large losses are typical of short volatility strategies. 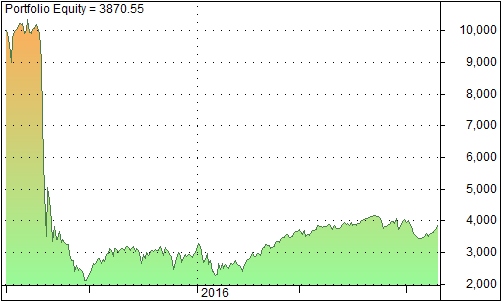 An interesting observation is that after the large drawdown, the strategy has recovered, as depicted by the upward trending equity line after August. This is usually the case for short volatility strategies. Despite the big loss, the overall return (not shown) is still positive. This means that the strategy has a positive expectancy. Drawdown can be minimized by using a correct position size, stop losses, and a good portfolio allocation scheme. Another solution is to construct limited-loss positions using VXX options. where EQ denotes the expectation value of X, a stochastic variable, in the risk-neutral world, and EP denotes the expectation value of X in the real world. X can be, for example, commodity prices, FX rates, etc. See reference 1 for a thorough discussion of various risk premia in financial markets. 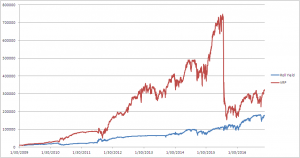 Of our particular interest is the case where X is the realized volatility (RV) of a stock or stock index. The risk premium in this case is often called volatility (or variance) risk premium (VRP). If we substitute X in the above equation with the RV of SP500, then EQ (RV) becomes the VIX index, and the VRP becomes VIX- EP (RV). 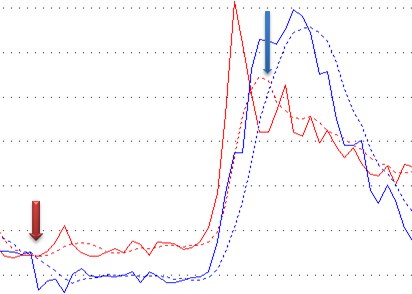 Traders often try to exploit the VRP by trading listed options or OTC variance swaps. 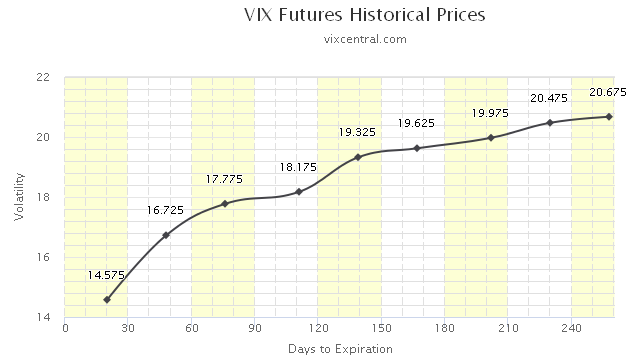 Another way to harvest the VRP is through trading VIX -based Exchange Trade Funds such as VXX. In this post we explore the latter possibility. The most difficult problem when designing a VRP-based trading strategy is that EP(RV), which is needed in order to calculate the VRP, is not observable. The best we can do is to use a quantitative method to estimate it. In summary, the VRP can be harvested through VIX ETF. However the drawdown is high. This strategy is viable if it is part of an asset allocation scheme. It would enhance the portfolio risk-adjusted return if we allocate, for example, 10% of our portfolio to this strategy, and the rest to equity and fixed income investments.